SEOUL, South Korea - European stocks rose on Wednesday and Wall Street was expected to edge higher on the open, despite losses in Asia. The price of oil continued to decline, however. Britain's FTSE 100 added 0.9 percent to 6,511.89 and France's CAC 40 climbed 1.4 percent to 4,186.08. 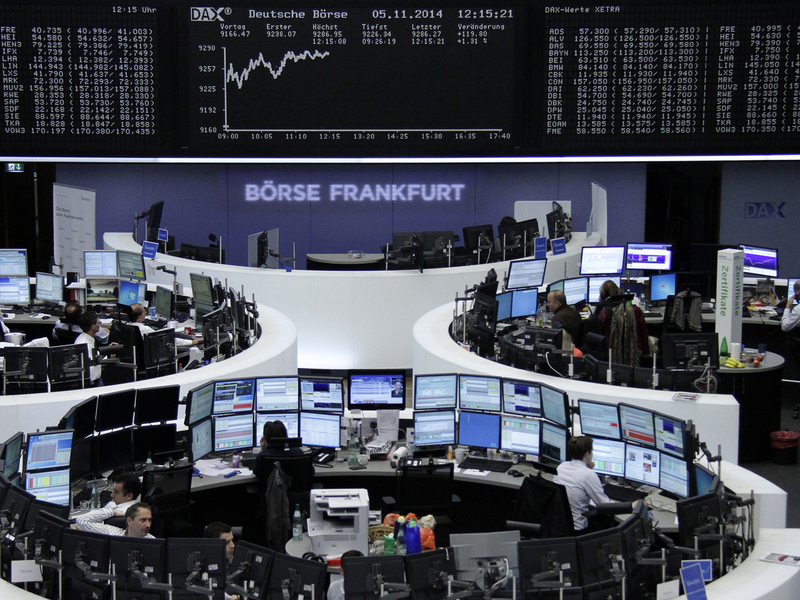 Germany's DAX rose 1.2 percent to 9,279.27. In the U.S., Dow and S&P 500 futures rose 0.5 percent. Benchmark U.S. crude hit a fresh three-year low before edging back up slightly, to trade down 2 cents at $77.17 a barrel. The contract fell $1.59 on Tuesday. Oil prices have been in a slump since the summer and fell further Tuesday after Saudi Arabia decided to sell its oil at bargain prices to the U.S. in a bid to maintain its market share amid a boom in U.S. production. "While there is certainly a lot of noise out there, I feel little has really changed and the key themes will remain a data dependent approach to Fed tightening expectations and what happens with the ECB and its easing measures," said IG strategist Stan Shamu. "While oil prices have been a talking point lately, following sharp declines, they could easily snap back and just as easily spike once the current driving forces are out of the way. As a result, I don't find this to be a huge investment threat." The European Union cut its already low economic growth forecasts on Tuesday, confirming the region's recovery will remain subdued at best this year and next. Fresh data on Wednesday reinforced that picture - retail sales in the 18-country eurozone fell by a larger than expected 1.3 percent in September. Asia closed mostly lower with Hong Kong's Hang Seng down 0.6 percent at 23,695.62. South Korea's Kospi dropped 0.2 percent to 1,931.43 while Australia's S&P/ASX 200 was nearly flat at 5,517.90. Markets in mainland China and Taiwan also fell while Singapore and India were slightly higher. Japan's Nikkei 225 erased losses in the afternoon, finishing up 0.4 percent at 16,937.32. Shares of Japanese telecommunications and internet company Softbank fell 2.3 percent in Tokyo after its quarterly financial report showed that its recent acquisition of U.S. carrier Sprint Corp. would weigh on its operating earnings. Sprint is eliminating 2,000 jobs, or about 5 percent of its staff, to cut $1.5 billion in annual spending. It reported a reported a $765 million loss last quarter. The dollar rose to 114.69 yen from 113.69 yen late Tuesday. The euro fell to $1.2472 from $1.2548.